Click here for the SAW versions of this plug-on. 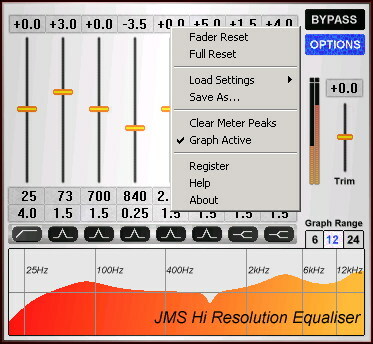 We are very pleased to introduce the JMS Hi-Resolution Equaliser for DirectX. Designed for mastering, the Hi-Res EQ is the culmination of months of research into filter design and assembly language optimization techniques, delivering a full 64 bits of computational accuracy. It was designed to sound smoother, warmer, and more detailed than any other plug-in Equaliser, and we think it succeeds. The demo is available on the download page; it can be instantly registered online and 'unlocked' into the full version. Compatible with any DirectX capable host (Sonar, Cakewalk, Cubase, Logic, Nuendo, N-Track, Acid, etc). Windows 98, ME, NT, 2000, and XP compatible.